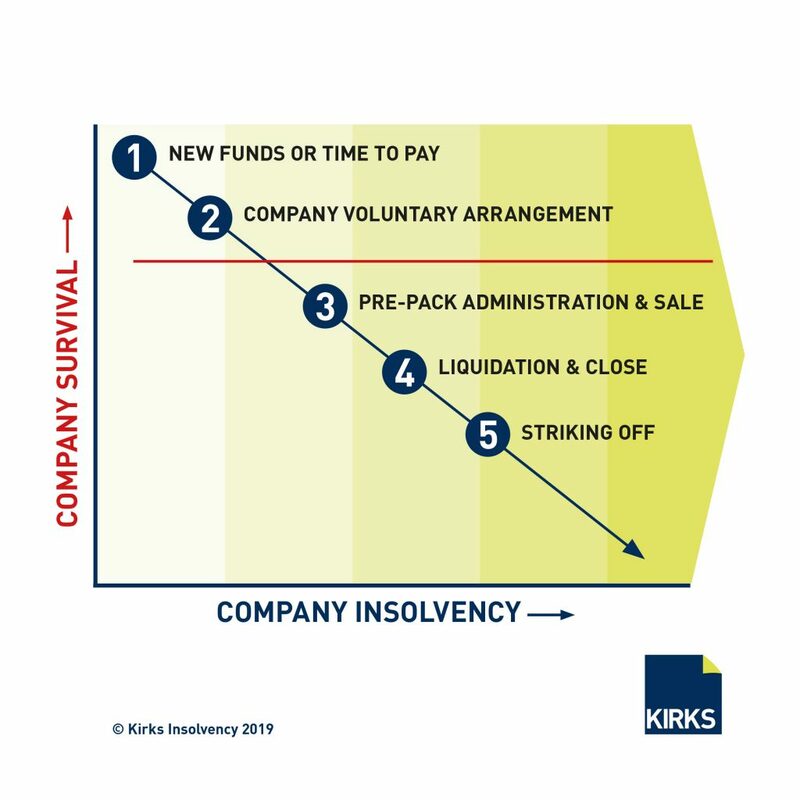 A limited company in financial trouble has five main options. Just to say when I talk about saving the business, I don’t necessarily mean saving the limited company. I mean saving the business within the limited company. Sometimes you can keep the trade going and the employees together by carrying on the trade in a new limited company. So, the red line marks where the limited company survives or not. When I first meet a new client, they often don’t know what they need to do or what the options are but broadly they fall into two categories. Those that know they are in trouble but are trying to survive and keep going. They may come and see me a few times as they try to fight to survive. They usually think their options re 1,2 and 3. Those where clearly it is over, and they cannot trade out of it. These options are usually 4 and 5. So what are the options in some more detail. Put in new funds or a time to pay arrangement. This is typically a company that has had a one-off hit for example a large bad debt and have a core business that makes money and they just need some time. Often with a time to pay this means asking HM Revenue and Customs (“HMRC”) to give you 6 to 12 months to catch up with vat or PAYE arrears provided they you can keep the current payments up to date. This is reasonably easy to secure if it is the first time you have asked HMRC. Other suppliers are usually are okay if you ask them to let you have 3 to 6 months. Put in more money – another example of this sort of situation is the shareholders or directors putting in more funds to cover a bad patch. Example: ground works company. £5m turnover about 30 employees. He loved buying machinery and vehicles and more than he really needed. There were PAYE arrears. HMRC got fed up and issued a winding up petition. I met the director and told him when that petition is advertised his bank account will be frozen. I told him to get ‘real’ and sell some plant – he could then pay the tax debt off. We got HMRC to give him a 3-month TTP. He survived. Company Voluntary Arrangement (“CVA”) – these are rare and hard to get off the ground fast enough. Basically, it is an extended time to pay back some of what you owe over up to five years. HM Revenue and Customs are hard on them and but usually vote yes. They will usually block you taking any dividends during the period of the CVA. You need 75% of creditors to approve the CVA and they nearly always do. Unfortunately CVA’s often fail at a later date because the company has overpromised or not solved its fundamental problems. Most suppliers in a CVA want cash on delivery for supplies post the CVA and the company credit rating is tarnished. Example: a marketing firm dealing with blue chip clients who he knew they would not accept being moved to another company. So, he had to keep the existing limited company going. We got the CVA approved with him paying back £2,000 pcm. HMRC insisted he also pay back his overdrawn DLA. He made it for three years then hit another bad patch and went into liquidation. Pre-pack Administration sale. This where you line up a buyer before Administration and agree all the terms of a sale. Then go into Administration and sell the assets. Creditors do not like them as they feel this is unfair. They can be used to settle shareholder dispute and the richest shareholder wins by buying back the assets and business. Our regulators review what we have done carefully as they have a bad press. A key rule is the business has to be advertised for sale to justify the sale price but often the advertising is very limited, and you don’t have long to save the business. The other alternative is Administration without knowing who the buyer is. We use an agent to advertise the business for sale. Administration can also be used for a more organised wind down for example to finish off work in progress. One issue is in an Administration is TUPE applies – so employees have to legally follow the new owner, and this scuppers many sales as it means the business can not be easily slimmed down. Example: Software business with 200 shareholders. They had used up £2m of investor funds and run out of money. They had a nearly finished software product. So, we have put this into Administration knowing some of the shareholders will want the business. We have gone to best bids. What is it about software companies they always spend too much of investors’ money on office furniture. Liquidation. This is where a business is closed, and any staff laid off. If there are premises these are closed and locked up until an auction of the assets later. There are a couple of options here – the director does not want to carry on so just hands us the keys and we get on with it. The second option is they want to buy the assets back and carry on in usually a reduced form which we can help them do. They just have to pay the ‘auction’ value of the assets. Liquidation takes about 10 days. There is no longer a need for a creditor’s meeting unless at least 10% of creditors request it. In my experience in liquidation we find debtor collection is always a problem. Lots of invented disputes. Sometimes we find there are illegal dividends or overdrawn loan accounts. We take a sensible approach on these, but they should be paid back to the company. Note that more and more companies seem to owe Funding Circle – and they like to choose their own liquidator. Surprisingly there is no TUPE in liquidation. So, employees do not transfer. Example: bakery going 100 years. We liquidates the company and soldl them back the assets to carry on but on a smaller scale. There were 30 employees who wanted to be made redundant so they could claim from the Government fund called the RPS. The RPS pay out redundancy and other employee claims. Striking off. It only costs the £10 Companies House fee to strike off a company but be careful. It’s useful for a defunct company that is no longer trading that maybe has just a few creditors. HMRC will often lodge an objection if there are tax returns outstanding (but really so what). After three months the company will be struck off. You need to follow the rules as explained on form DS01 and notify all creditors, employees, shareholders, pension managers and other directors of your application to strike off. You have seven days and failure can be a criminal offence so in many cases directors like to take the safe option of liquidation.